In 1936-37, Sofia Finkel, who was born in Tepic, Mexico where her parents had emigrated in the 1920s, spent a year and a half with her relatives in Łódź, the Margolin-Spektor family, along with her mother, Adela Margolin de Finkel. Sofia’s uncle, her mother’s brother, was the writer Dr. Julius Margolin. While in Poland, Sofia’s mother arranged for Izrael Lejzerowicz to do two paintings of her young daughter. 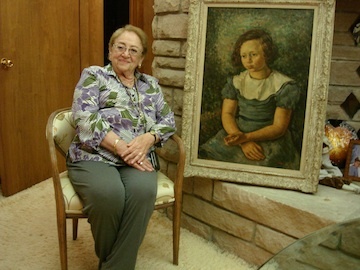 One of the paintings now hangs in Sofia Finkel de Karasik’s home in Beverly Hills, California, where this short interview was recorded in June 2013. Click above to listen.